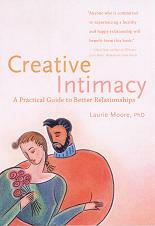 Creative Intimacy is designed to help you with your relationship in several ways. You can turn shyness to confidence overnight. You can avoid a divorce by knowing your partner’s romantic uniqueness. You can turn years of arguments into positive solutions in one minute. You will create the most durable solutions to relationship challenges with gratitude. When you take charge of releasing a self defeating pattern, you automatically make room for a relationship miracle. The book will guide you to discover new ways of interacting with life. By better understanding your partners' perceptions, you can be of more service to her or him, thus making both of you happier. By understanding your own way of perceiving life circumstances, you can better communicate to your partner specific ways to help you feel more loved. This book will inspire you to expand your repertoire of life experiences. As a result you will encounter more pleasure, more joy, and unexpected solutions to struggles. Creative Intimacy is an invitation to enter into a world of limitless possibilities in making relationship fun, valuable, and precious. After all, we are here to love. With spontaneity, creativity and a fresh perspective, love is reborn again and again.